Moths cover the walls in the claustrophobic antechamber of the Eloy detention center in Eloy, Ariz. The fluttering insects are dark brown, obvious against the stark white cinderblocks where they crawl toward the room’s single door. “My grandmother said they were reincarnated souls,” said Dago Bailon, my guide to this Dantean holding cell for America’s undocumented immigrants. I’ve arrived at Eloy with Bailon and other representatives of Trans Queer Pueblo, a Phoenix-based organization whose goal is to assist LGBT undocumented immigrants, providing legal help, access to healthcare, job training and a sense of community. The town of Eloy is about 80 minutes south of Phoenix, along a desolate expanse of Route 10, and the detention center stands completely isolated from any commerce or housing, although the facility is one of the town’s leading employers. The August sun is unforgiving on the day I visit with Trans Queer Pueblo, a trip organizers and volunteers make monthly to visit detainees in the hopes of connecting them with legal aid. Five rows of razor wire tower over our heads as we walk up to the entrance. We’re buzzed in by unseen guards at each subsequent door, and as the last one shuts behind me and we enter the detention center, I’m grimly aware of how many obstacles are between me and the outside world. Each member of the group has the name of someone inside, a person to visit. We take a number and wait to be called. After about half an hour, it’s my turn, and I go up to the guards’ desk. They take my paperwork, my passport, my driver’s license and my bank card before I walk through the metal detector. I am allowed no cell phone or even a pen and paper. I now have no identity — a non-entity inside a veritable prison. I first met Bailon months earlier at a café in Phoenix. Many of the people I spoke to for this story tell me of their own migration, as well as those of family members – parents, grandparents, siblings and cousins. They are harrowing tales, involving insurmountable odds and, sometimes, death. Since the U.S. Border Patrol began keeping statistics on migrant deaths in 1998, the Arizona border boasts the deadliest record of any other border area in the country. Bailon, who is now 29, crossed with his grandmother and brother and remains undocumented in a state infamous for its rough handling of Mexican immigrants. In 2011, he helped to found the Arizona Queer Undocumented Immigrants Project in response to the state’s 2010 legislation SB 1070 that was widely regarded as the most draconian immigration law in the country. One of its provisions stipulated that police officers were required to demand papers from anyone they suspected of being in the country illegally. If the suspected immigrant did not have their papers on them, it was considered a misdemeanor. Within five years, however, Bailon and others founded Trans Queer Pueblo in order to address the wide scope of disenfranchisement faced by LGBT undocumented immigrants – healthcare, job training, legal aid and, of course, the confluence of immigration and homophobia or transphobia. Even in the organization’s nascent days, Bailon and others heard of gay men, lesbians, bisexuals and trans people in detention centers who desperately needed contacts, legal aid and advocacy to help them navigate a system that often proves deleterious to their safety. Physical and sexual assault and suicide are commonly reported from those inside the detention centers. One of the recent cases that gained national attention was that of Marichuy Leal Gamino, a transgender woman who reported being raped by her male cellmate in 2014 at Eloy. A 2013 study by the Center for American Progress stated that LGBT detainees are 15 times more likely to experience sexual assault than their heterosexual counterparts – a threat well known by Karyna Jaramillo, a trans woman who spent two weeks in Eloy in the summer of 2015. As I walk into the larger waiting room at Eloy, “Captain America” plays on the television. The iconic white hero frees prisoners of war from a cage just as we’re about to enter one. Chairs and benches are filled with visitors, mostly young mothers trailing children or elderly men and women, some limping, others with the shakes. Every single one of the people I see in the waiting room over the next three hours is Latino. Shortly, the discomfort and anxiety at being trapped inside gives way to the tedium of bureaucracy. There’s nothing to be done but wait for our visiting time slot, which could be in an hour or several. The credits roll for “Captain America,” but not before a little girl claps her hands and chants his name in excitement. Family members buy candy, chips and Hot Pockets from the vending machines that only take special payment cards you can purchase for a fee outside the metal detector. Eventually, our turn comes, along with about 20 others, and we’re ushered into a holding pen. The door shuts behind us and locks. Another door in front of us opens, and we’re finally in the visiting room. It’s packed. A mother carrying a boy with Down syndrome rushes to embrace a man, seemingly the boy’s father. There are smiles and tears. People share Fritos, candy and conversation while a tall, broad-shouldered guard patrols the room. Bailon and I meet with an immigrant who describes himself as bisexual. He doesn’t know I’m a reporter. If I were to declare myself a journalist upon entering Eloy, I never would have made it past the front desk, and the circulating guards in the room make it impossible to have a private conversation. What I can say is that listening to his story – the death threats in his home country, the mind-numbing conditions of detention, the Kafka-esque bureaucracies he’s wrangling in order to obtain asylum – I wonder how anyone in this place retains their sanity. Jaramillo said her stay at Eloy was a battle against her own mind as much as the system itself. Jaramillo, 46, only got out of Eloy after she finally spoke to a U.S. Immigration and Customs Enforcement (ICE) representative, who set her bond price at $5,000. Her family was only able to raise $4,500, but ICE accepted the lesser amount and let her go. Jaramillo, born and raised in Cuernavaca Morelos, about an hour south of Mexico City, first came to the United States 27 years ago. She says there weren’t as many border guards then and crossing was relatively easy. Thirteen years after her initial entry, she was living in Texas and got pulled over by police for expired license plates. She was deported, and the journey back to the United States was torturous. At first, she was caught, but she made the attempt again the same day. “Coyotes” are human smugglers who get people across the border for a steep price, and they’re known for leaving their charges to die in the desert or demanding more money than originally agreed upon. When I asked Jaramillo what would drive her to risk such an experience across the Sonora, she begins to cry. About a decade after her second crossing into the U.S., Jaramillo, who has struggled with alcoholism, began drinking again. She was stopped by the police, and upon investigating her background, they discovered she had an unpaid DUI on her record from 10 years prior. The police contacted ICE, and six ICE officials picked her up outside of the gym. They handcuffed her and eventually sent her to Eloy. She was detained with other men, and in recounting her time there, she begins to cry again. Without access to her hormones, Jaramillo said she began thinking of committing suicide. She told the medical staff at Eloy about her needs, and they did give her hormones and antidepressants. However, she’s dubious about the center’s motivation and fast turnaround time. 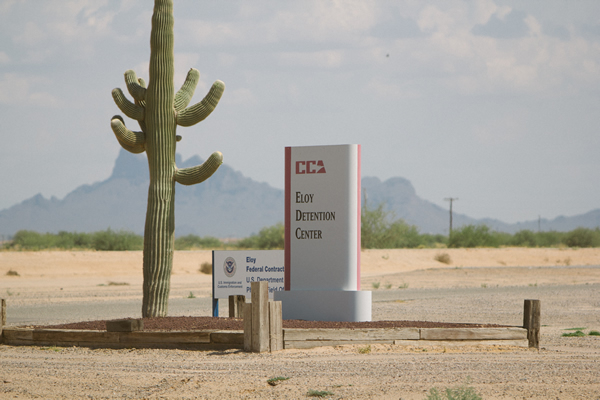 The Eloy detention center is run by CoreCivic, the newly renamed Corrections Corporation of America, a publicly traded company that owns and runs both prisons and detention centers. Its reach in the industry is large, trailing only the federal government and three states, and it works hand-in-hand with ICE, which has 34,000 beds reserved for immigrants nationwide every night. At the time this article was written, CoreCivic’s shares were going for $20.92 on the New York Stock Exchange, after a 43 percent jump in price the day after the presidential election. When dealing with privately owned companies of this scope, questions of regulation are bound to surface with immigrant rights advocates decrying the conditions in which detainees are held at private detention centers. According to a November 2016 Washington Post article, ICE holds more than 60 percent of its detainees at private facilities that follow, as Morris puts it, their “own set of rules,” which, historically, hasn’t been good for LGBT detainees. In statements sent to the Blade by CoreCivic and ICE, both parties stressed their commitment to insuring the safety and well being of detainees. He also stated that the company’s “eight ICE-contracted facilities adhere to the federal government’s Performance-Based National Detention Standards,” a detailed document of instructions regarding all aspects of a person’s detention, from hygiene to segregating an individual in solitary confinement to secure their safety or, in certain cases, as a form of discipline. ICE also has a designated national LGBTI coordinator and field office liaisons for local officers. Pitts O’Keefe reports that detainees have access to a toll-free number where they can report any abuse, even anonymously if they choose, and a flier about the hotline is posted in every ICE facility. Yet neither Pits O’Keefe nor Burns addressed my question about the seeming discrepancy between what the official policies are and the first-hand accounts of LGBT immigrants’ detention experience. Flor Bermudez, the detention project director at the Transgender Law Center in California, fills in some of the gaps, especially about ICE’s Transgender Care Memo. Finally, she said LGBT sensitivity training for staff at the detention centers, at least as it concerns trans people, is inadequate. CAP released a report in October stating that ICE officials kept greater numbers of LGBT immigrants in detention during fiscal year 2015 than 2014 – 88 percent of the time – instead of releasing them to community advocacy groups for monitoring. In 2014, ICE, at the direction of the Department of Homeland Security Secretary Jeh Johnson, began to implement the Priority Enforcement Program (PEP), which enabled law enforcement and ICE officials to work together on identifying undocumented immigrants. When local law enforcement arrests and books someone, they send fingerprints not only to the FBI, but, under PEP, to ICE as well, allowing all parties to identify undocumented immigrants considered a threat to public safety – a designation defined by Congress in 1996 with the Illegal Immigration Reform and Immigrant Responsibility Act. It’s no secret that the Obama administration has deported more people than any other, claiming they’re focusing on criminals instead of young people and families. However, something as innocuous as jumping a New York subway turnstile can result in a criminal charge. “I think the Obama administration was great at…tossing what was a temporary Band-Aid and then allowing us to bleed in another way,” said Bailon. Despite the Obama administration’s high deportation numbers, the looming Trump presidency is causing even more anxiety. 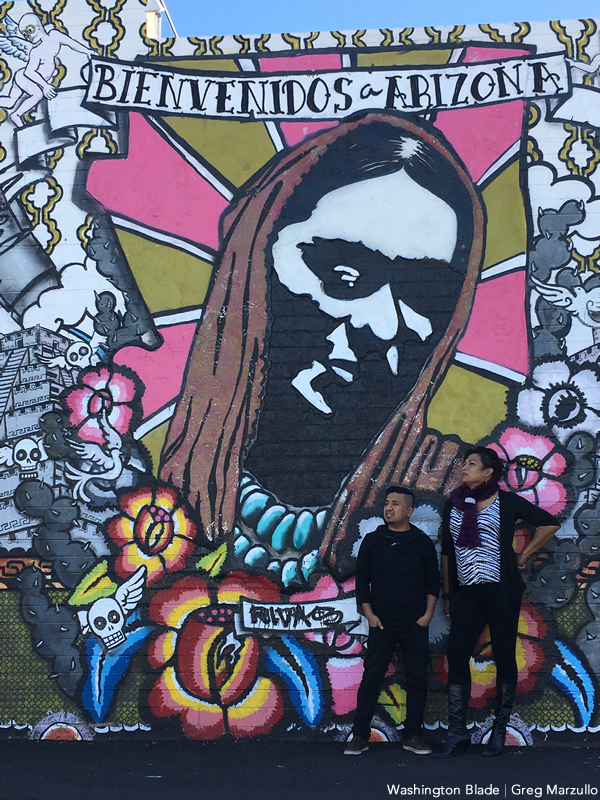 For Bailon, Jaramillo and others, returning to Mexico or other countries where homophobic and transphobic violence are the norm, the increased threat of deportation takes on life-or-death consequences, and the day-to-day pressure of living in the U.S. as an undocumented immigrant increases exponentially. After almost four hours inside Eloy, it’s time for us to go. As I walk out the door of the visiting room, I cast a backwards glance at the crowd and see a door at the opposite end. It looks just like the one I’m standing in – the same color, presumably the same make – but its destination is much different. In a few moments, I’ll get my passport, driver’s license and debit card back with relatively little hassle. I’ll pass through three more doors and stacks of razor wire, go to the parking lot, get in the car and text my husband that I’m out. I’ll drive home to my apartment, and my life will resume. That other door, though, on the far end of the visitors’ room, leads to a labyrinth where people seeking asylum or hoping to live that capricious American dream are lost in the bowels of institutionalized racism, xenophobia and anti-LGBT bias. Sitting at lunch with the Trans Queer Pueblo workers after our visit, Jaramillo asks me how my experience was inside. I tell her that I was surprised not to be frightened. More than anything, I was disgusted. I ask her what makes her come back to this place where she, herself, suffered detainment and the possibility of sexual assault. I do not understand why these people want to come here to America. Or if they do want to come to America why don’t they do it legally and avoid these kinds of circumstances? Or if they feel compelled to leave their own country, why not choose a more hospitable place than here?